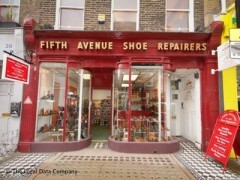 About: Fifth Avenue Shoe Repairs specialise in shoe repairs, bag repairs and key cutting. They also offer a selection of traditional mens shoes plus a range of accessories including key rings, umbrellas, shoe polish and a small selection of luggage. Cards are only accepted for retail, not repairs. Customer service training for front line staff . I really don't care how good they are I wouldn't spend my money in that shop. I have been searching for a shoe repair shop that would repair the whole bottom part of on my bellowed 'old-fashion' looking ladies lace-up boots. Of course I fist looked high and low to sea if I could by a new pair anywhere but I couldn't find any that had the right heal, cut and style. they either looked tacky or cowboy or lumber-jacky. Once I saw the superb job Fifth Avenue had done on my husbands Australian Jodhpurs then I thought it would be worth asking them to fix my boots too. Admittedly it was not cheep but I have my wonder-full boots back in a complete and comfortable state. Unfortunately, the comments on service rang true for my experience. I went to enquire about getting the strap of a sandal stitched. I was advised it would take a week and, if I wanted it done quicker, I should go to Timpsons, where it was clear i'd got them resoled. That would be fine but the tone this was said in was basically accusatory - if I'd gone to timpsons before I shouldn't expect to be dealt with politely here. Such a pity as I'm sure they actually do a great job. I'll just never know as I don't want to face that tone again! Customer service is on the grumpy side but I wouldn't take my shoes anywhere else. They can even resole RM Williams boots to a good standard. I've taken my pairs to other reputable repairers and have only ever had poor to middling results. I have been using Fifth Avenue Shoe Repairs for many years and was generally satisfied with their work - until today. They never give repaired shoes a clean and shine before returning them to the customer, which, at the prices Fifth Avenue charge is a little disappointing, but pales in comparison with the abuse I had to suffer at the hands of their staff today. I picked up a pair of Chelsea boots that needed their soles to be stitched on. This demanded a cut in the rubber soles, which seemed a little deep and had very shredded edges. The frayed rubber could have easily been tidied up with a sharp blade within the 2 1/2 days of repairing time. When I pointed out that I thought the repair to be "a bit messy", I was shouted down and told to look for another shoe repair place by the very aggressive and unsympathetic staff. Their work might occasionally be a bit lacklustre, but their customer service is frankly offensive. I used to be a loyal customer, who supports local business. But now I might just heed their advice and look for another place; and so should you. DO NOT USE THIS STORE. This morning I was VERBALLY ABUSED in Fifth Avenue Shoe Repairs by the owner in the most shocking thing that's ever happened to me in a store. As I came in the owner was already being off-hand with another customer and was rude to me from the word go. I came in to pick up an orange patent heel which was broken and though had been pinned back together, the patent leather (which had been perfect) was really scuffed and looked a mess. When I began to say that this was not how I'd handed the shoe over the owner flew into a rage and started being very aggressive and abusive. I'd brought the shoe in a couple of weeks earlier assuming it couldn't be repaired but the person I dealt with was friendly and assured me, to my surprise, that it could easily be done. So that was the good news, but although mended, they now look so damaged following the repair (which cost £45) that I wouldn't wear them. I didn't speak to him with attitude, I was just trying to explain that I was disappointed at the state they were being returned in. He didn't let me get my words out of my mouth before starting to be abusive and said over and over he didn't want to know without listening to a word I was saying. It was totally shocking and I felt physically threatened - he BLOCKED ME FROM LEAVING THE STORE with my shoes. If the scene had gone up a notch I'd have called the police. At the moment I'm looking at ways to get some redress for this and will be posting this note in appropriate public places to warn other people not to use Fifth Avenue Shoe Repairs. Fifth Avenue is an exceptional shoe repairers in that the knowledge of the staff, materials used (for repairs), skill and finishing are all probably unequalled in London. It offers a complete bespoke shoe and bag repair service, unlike some other shoe repairers which are more like heel bars. The service is traditional, providing a quick glimpse of an antiquated world. But what really stands out is the effortless expertise. Master shoe repairers of a high order. In addition, they stock a range of men's shoes, in various styles and quality leathers. For formal wear, brands such as Cheaney, but also others such as Sebago to go with smart but casual wear. Glancing at the shelves with shoes on is refreshing after being subjected to seeing lots of people wearing disposable vileness such as trainers on the street.